Good morning friends!! 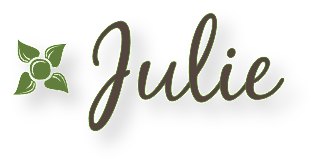 Julie here with a little project I've been working on. 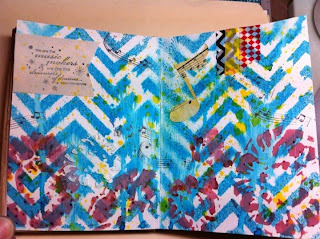 Ok, confession here, this is really for our Altered Book challenge way back in February - eek!!! I'm so so slow with these altered challenges, it takes me forever to get my idea, and gather supplies, etc. But, I was so excited about the project that I thought you'd like to see my end result! I've mentioned here before that I recently took an online class from Christy Tomlinson and as part of the class we need to practice making backgrounds using paper, paint, stencils, rubons, doodling, embossing paste - basically whatever works and inspires you. I picked up a vintage book for $1 and decided to turn it into an art journal. The book is a smaller size which really works well for me as the larger art journal sizes intimidate me - lol! First I removed all but a few pages, I left the cover page in since it had the owners name and date (1895!) and of course I kept all the book pages for future use. I then cut a bunch of cardstock to size to make my "signatures" - basically pages folded in half to add to the journal. I used some white, some cream, some of the illustrations from the book, some of the pages from the book and I added little tags and glassine envelopes in some of the pages. I did an internet search and found a guide for sewing the signatures together - it was really simple and felt so cool to be actually sewing a book together! When it was all done, I glued the pages into the book binding using a bit of gauze as a stabilizer. Now comes the fun part! First I gave the cover a good coat of gesso and then started adding paper, tissue, book paper, whatever I could find to make the background. Then got out the paints and started adding some color and texture. In the end, when you paint the girl, a lot of the background gets covered up, but that's ok - it's all part of the process! This was my first time ever painting a person so please excuse her slightly lopsided head - lol! The rest was all about adding texture with writing, rubons, words, more paint, etc. That's my project, I hope maybe my process inspires you a little to try something new - it can be tons of fun!! I would love to see how you sewed the signaures in and used the tape? I love, love, love the idea of taking it apart then putting it back together with different pieces!!! 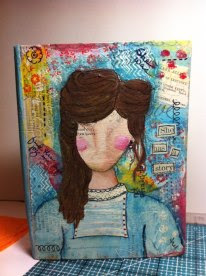 Gorgeous work - love that painted cover, beautiful... and like Donna-Marie I love the altered interior idea! I found your post very encouraging...I have never made a book and your sharing has helped! Your post really encouraged me! Thanks! This turned out so cool, Julie! I love it. 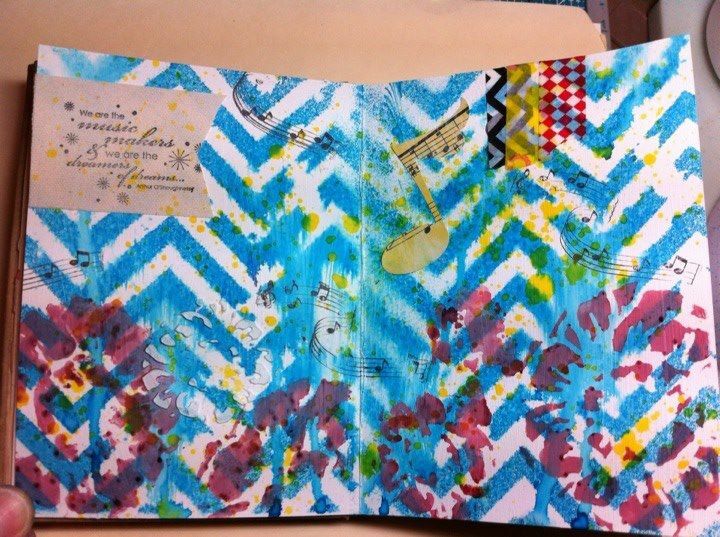 Some day I'll get up the courage to go for this art journaling thing. So intimidatng, but I am intrigued. Julie, this is totally gorgeous. You GO girl! Love that cover. Woohooo Julie..well worth the wait...Stunning...love the cover too!! Get Altered (Fabric) - Winner! I've Got The 'Blues' ! Mixing Unity and Studio 490!